How do you talk with someone if you completely disagree with everything that person believes? Sally Kohn, formally a liberal FOX news contributor and current CNN political commentator, believes it is compassion. In this country’s charged political climate, there couldn’t be a better time to be actively cultivating compassion. In a TED Radio Hour from December 2014, several speakers (including Kohn) discuss their thoughts on compassion for kids. In listening to this TED Radio Hour piece “Just a Little Nicer”, what struck me was how both Sally Kohn and Krista Tippett, journalist and host of “On Being”, talked about compassion for kids. Tippett characterized compassion as, among other things, both kind and curious. Kohn talked about “emotional correctness” as a better goal than “political correctness” and posits that if we use compassion when talking with others we will really be able to hear one another and keep open the lines of communication. Later in her interview, Tippett says that compassion for kids can be practiced like piano or baseball. So how do we train ourselves to be more compassionate? 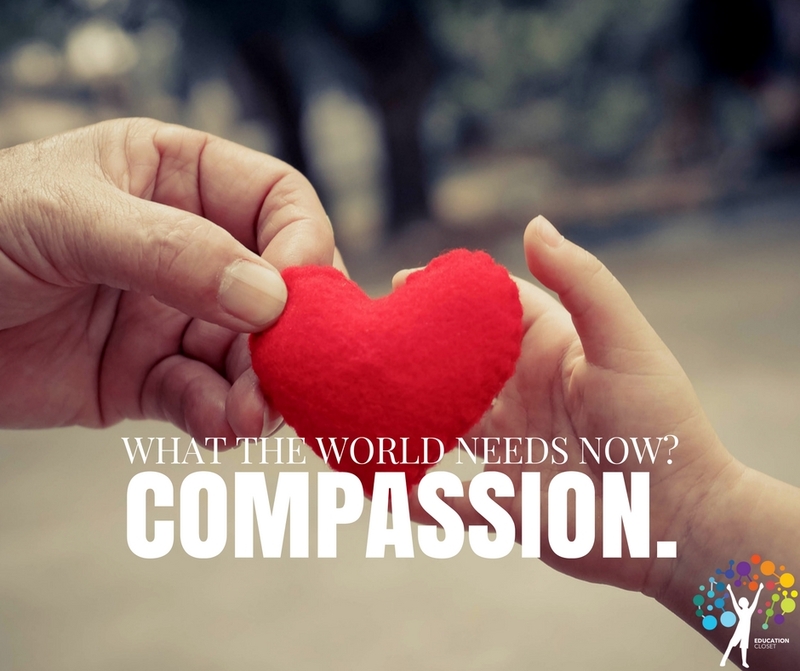 How do we practice compassion? One way is through the arts. The area of the arts which seems to provide the most natural connection to practicing compassion is theatre. When Kohn talked about how she dealt with talking to people who sometimes wanted to obliterate everything she holds dear, she said she had to find emotional common ground. She may not agree with their political beliefs but the emotion behind them was a starting place for a conversation. As an actor, if you have to play a character who is fundamentally different from you, how do you play that convincingly? You find an emotional connection. You try to understand why the character behaves the way s/he does and think of a situation where you had a similar emotional experience. You remain curious and open-minded and approach your character with kindness. Once you find that emotional common ground, you are ready to give a more believable performance. If you are able to find that place of connection with a character from a play, you will be better able to do that with people with which you differ, especially if the teacher helps you to see that connection and transfer that skill to your daily life. Another element of compassion is listening. Guy Raz, the host of the TED Radio Hour, comments to Tippett that listening is an act of compassion. That is also an element of theatre, especially in improvisation. In order for improvisation to work, the actors must really listen to one another and respond accordingly. If you become oppositional in improvisation, you run the risk of bringing the scene to a screeching halt. If you negate the reality that another actor has presented there is nowhere for the scene to go. The same is true in conversation. If you cannot listen to other’s points of view, if you cannot be present to them when they speak, they will not be able to hear you. If you shut them down as soon as they make a statement, the conversation is over. There are so many important skills that can be developed in theatre, not the least of which is learning to be compassionate. If we as educators help students hone that skill of compassion in theatre and then help students see the real-life application, our classrooms and our society will be the better for it.